You need to see rally in person to truly understand how awesome it is. Tv and slow motion WRC cars are cool but its 100 times better in person. If you've never been to a rally in the US, this weekend is you're best chance - if you live on the east coast. 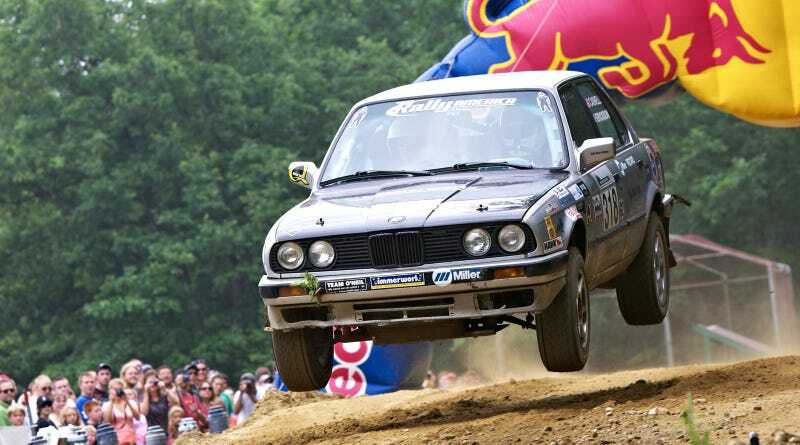 Nasa Rallysport is hosting Rally West Virginia at Snowshoe mountain, WV this Saturday and Sunday and The New England Forest Rally by Rally America starts today and continues thru tomorrow at Sunday River Ski Resort in Bethel, ME. Both of these rallies are great to spectate because they are in nice locations and are easy to get to. Snowshoe Ski Resort (Rally WV) is practically brand new and on the top of the mountain with ridiculous views of the valley. They also have this cool little walking village full of bars restaurants and a Starbucks. There's also a hill climb (for cars) and a huge downhill mountain bike competition on the same weekend out of the same resort. The ski village becomes a fun place to party. Sunday River Ski Resort for New England Forest Rally is very similar with the ski bars littered around the condos which are pretty reasonable to rent when there's no snow. And of course you can camp out at either rally if you want. So here's how it works. It's basically an awesome road trip with a race and a bunch of partying in the middle. So call you car friends, or the ones that like to go see new things, and tell them are hitting the road this weekend. You don't need to bring much with you, but a few items will make you trip way nicer. Cow Bell or Air Horn (this need will become more obvious when you get there). Here are two spectator guide's which shows you where the official spectator spots are: Rally West Virginia. New England Forest Rally. If you forget, you can find printed versions at registration and usually at the local gas stations and convenience stores around the event. Don't rely on your cell phone as you will lose coverage here and there making it a huge pain. Best to print them or get a copy and I usually grab screen shots of the guide on phone before leaving 4G areas so you can access them thru photos. Also, it makes the most sense to go to the planned spectator areas. Sure, there could be some cooler place to maybe see a scary corner, but don't forget two guys were killed doing this about a decade ago. Best to just stay with the crowds in the controlled areas. Plus the party is at the spectator area anyway. And the drivers will have these areas in their pace notes. For some that means extra sideways making the designated areas a cool place to watch. As for how to watch the rally? I follow the leaders but pick a random car that I like or a team I meet along the way and follow them. Every rally begin each day with a Parc Expose which is just a fancy name for a car show. Every competitor will be there and should be hanging out with their car having fun and answering questions. I try to find them at service and say hi if they have time. See how their recent stages went. Ask about the car. Then I go back out on stage and see how they do relative to their direct competitors. I feel more of part of the rally and have a greater understanding of what's going on than simply watching 40 or 50 cars rip thru the woods at a time. Although that's pretty cool by itself at times. If you're someone that would rather work or be a part of the event then you should be volunteering. Its a ton of fun. You get put on a team with a bunch of other rally fans and you at the work time controls or stage safety making sure the public doesn't ignore a road closure sign and enter the course. This also means you watch all the cars rip by the access point. And you usually get a cool T shirt and some events (every Nasa) cover your meals. This link will take you to volunteering and the different assignments. Oh yeah! If you have a 4x4 and like pulling things out of ditches than rally is going to be your favorite weekend of the year. Most events need sweep trucks and you get pull all the carnage out of the woods. Ever see a rally car disappear into a forest at 85mph? Its a mess. But it can be a ton of fun if you're the guy that gets to drag it back out! I know I'm missing a ton of stuff, so if you have first time rally experiences and tips to share, please do in the comments below. Now go call your friends and change the oil in the car, it's a road trip weekend. And if your friends hate rally round up some other Jalops and meet up at the race. Its a good time. I promise. I'll leave you with one of my favorite stage videos. It's Ken Block setting a record on Concord Pond a few years back.